Western Europe. Austria. Belgium. Denmark. Faroe Islands (Denmark). Federal Republic of Germany. Finland. France (including Andorra and Monaco). Gibraltar (UK). Iceland. Ireland. Italy (including San Marino and Vatican City State). Jan Mayen (Norway). Luxembourg. Malta. The Netherlands. Norway. Portugal. Spain (including Andorra). Sweden. Switzerland (including Liechtenstein). Svalbard (Norway). United Kingdom. North America. Canada. Greenland (Denmark). St Pierre et Miquelon (France). USA. Australasia. Australia. New Zealand. Papua New Guinea. Index. Topographic mapping plays a basic and important role within the extensive field of cartography. In recent years, this type of mapping has become somewhat neglected and available literature is normally restricted to details concerning the programmes of individual countries, often presented in the form of monographs. Topographic maps are essential tools for use in development projects, resource exploitation, the planning of construction, infrastructure and recreation. Furthermore, they give a detailed illustration of the relative degrees of development of areas within a landscape and are thus unique in demonstrating the cultural status of a country. 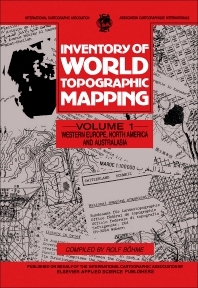 This book is the first of three volumes and provides an introduction to world topographic mapping giving details and examples of topographic maps from Western Europe, North America and Australasia. The information supplied for each country consists of a text, including a brief history of the development of topographic mapping, geodetic data, map scales and series, as well as extracts of maps and index sheets illustrating the present status of map coverage within that country. There is currently no other work employing the approach adopted in assembling this `inventory'. This work is a comprehensive and important reference and source book for information in the field of topographic mapping. For cartographers, geographers, geologists and those involved in planning.